Chavittunadakam is a colorful Latin Christian dance form that originated in Cochin city of Kerala India. It is noted for its attractive make-up of characters, their elaborate costumes, detailed gestures and well-defined body movements presented in tune with the rhythmic playback music and complementary percussion. Chavittunadakam is a folklore art practiced by Roman Catholics belonging to Latin Rite in the districts of Thrissur, Ernakulam and Alappuzha of Kerala state in India. Chavittu Nadakam is believed to be originated during the 16th century AD. Chaviitu Nadakam is a Latin Christian folk art form of Kerala. It is originated in Cochin where the Latin Christian Portuguese missionaries have instituted their first mission. Chavittu Nadakam is believed to be originated after the arrival of Portuguese to the Kerala shores. The reason behind this assumption is that Chavittu Nadakam has a significant European character in its costumes and outfits. But there are historical evidences that Kerala had connections with the western world well before the arrival of Portuguese. This form of play is prevalent among the Latin Christian community in the districts of Alappuzha, Ernakulam and Thrissur of Kerala. 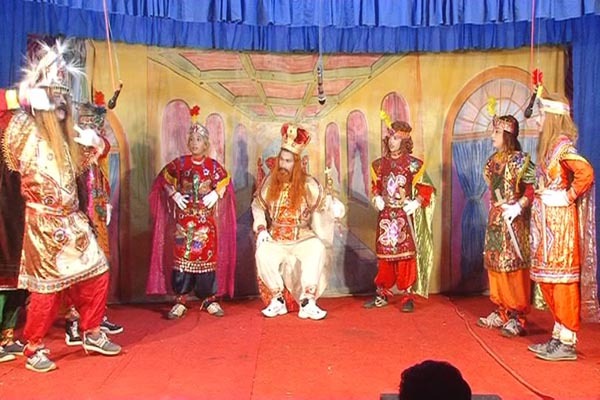 Chavittu Nadakam is performed in open space The whole play is performed through musicals. Dance and instrumental music are combined in this art form. The bell and drum are two instruments used as background score. The actors themselves sing and act.The stories are mostly the heroic episodes of Bible or great Christian warriors.They sing their lines loudly and with exaggerated gestures and they stamp their feet with great force on the wooden stage.